While numerous organizations for women entrepreneurs exist in Toronto, Women on the Move is the only one that incorporates co-working space, business training, venture capitalist funding and a community network. When co-founder of Women on the Move Heather Gamble introduces herself to me following a networking workshop at the Dundas Street West co-working space, she describes how she “climbed up the AT&T corporate ladder” before the age of 35 because she “could sell any early adopter technology.” After leaving her roles in sales and marketing at the company, she launched her first business with Eva Gooderham in 2004. In her first year with their business-to-business marketing firm SalesFuel Inc., she won a $1-million contract with Shaw Communications. Her story sounds to me like a well-rehearsed sales pitch, which I imagine her delivering hundreds of times. Data collected by Statistics Canada shows that women small business owners had less revenue growth than men (57.7 per cent compared to 62.4 percent) between 2009 to 2011. According to Forbes Magazine, only 2 percent (4 percent in Canada) of female-owned businesses in the United States reach $1 million in revenues while male-owned businesses were 3.5 times as likely to do so. Gamble lays the blame more on women’s own inhibitions than on systemic discrimination, noting that women tend not to speak up when men are around. “I felt it was imperative to give women their own place and space for them to say what they really believe, come up to the table and be fully engaged participants,” she explains. In terms of preparing students for the reality of life outside of the training, Morgan says they assess what skills each individual might require and focus on helping them understand and sell effectively to both male and female buyers. While women often take a more complex approach, when men are doing business, “it’s just business,” says Morgan. “We do work with women to (help them) understand how men think and that they do think a little bit differently than we do. So, really, it’s all about understanding your buyer, whoever that buyer may be,” she explains. “Men don’t really care how you feel,” but women, generally speaking, are much more focused on their feelings, according to Morgan. 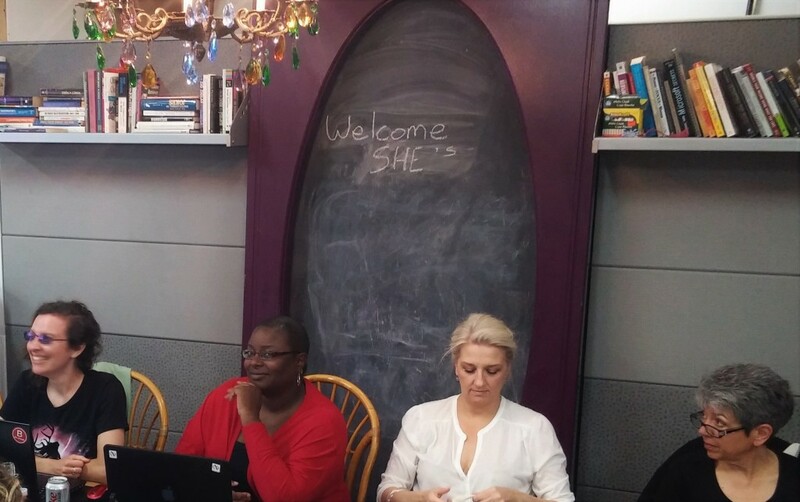 Women on the Move member Michelle Isocianu and co-owner of Board Again Games happened upon the space when she was searching for a location to rent out for board game nights and ended up registering as a student in the She Factory business training program. She says the course has taught her “basic business 101 stuff” and how to apply that specifically to her own enterprise. But it has been the support of fellow participants and the instructors that has benefited Isocianu most. “It’s nice to know that other people are going through the same thing,” she says, adding that the course has helped her to increase revenue and make wiser investment decisions. “I think going back every week and Heather being like, ‘You’re perfect and you’re great,’ – as cheesy as it may be – it does give you the confidence,” she says. “I certainly have gotten the confidence to put a value on what I do.” Isocianu admits that at first she was intimidated by the “all women kind of approach,” but now sees the critical need for such a place. The She Factory is an intensive training program that runs weekly from September to June. Although students can be anywhere in business development, from just starting out to two years in, Morgan urges women to enlist sooner rather than later. It incorporates elements of sales and business education for women entrepreneurs, with individual classes starting at $40 and personalized coaching that is tailored to individual budgets. Gamble’s initial mission was to train 10,000 women by 2020 and position them each on their “$1-million path” within three years. One of their first students, a business consultant in the mining sector, saw her business jump from $400,000 to $2-million in revenue after just one year. But their latest training session, which ran from September to June, brought in just 25 women. “It takes time to build a business,” admits Morgan, explaining they pour whatever financial resources they have into rent rather than marketing, which she notes can also be costly. They hope to increase their numbers by taking their business on the road — or rather the train — for a cross-Canada tour that aims to connect and train women entrepreneurs. In June, Women on the Move rolled out its “Save Our Sales” service, an app that offers access to a branding specialist, sales specialist, writing specialist and interpersonal personality specialist. The personality specialist can help business owners understand how to sell to different personality types by communicating and connecting with them more effectively. Don’t expect their training to include tackling the systematic barriers to equality that women entrepreneurs often face. Morgan herself claims that she has never personally experienced sexism as an entrepreneur; however, she acknowledges that inequality does exist and that women deserve equal opportunity. But she and Gamble choose to focus their efforts on helping women work within existing structures to boost sales and revenue. Publishers Note: Gamble and Morgan have also launched a new workshop series called Accelerate Your Success. It is held on Wednesdays from 12 – 2 p.m and includes a one hour workshop plus an hour of networking and a catered lunch. The focus is on developing effective sales and marketing skills with an emphasis on using social media to increase sales and find prospects. Tickets start at $40. You can learn more at www.womenonthemove.club. Ember: A co-working space with mentorship opportunities for women. For a more complete list of supports for women entrepreneurs across Canada, visit http://weoc.ca/ or download their eco-system diagram Womens-Entrepreneurial-Ecosystem_2016_03_01_weoc (1). Most women hate or fear sales JUST because they have never learned how to do it properly. I did my workshop “Sales Skills JUST for Entrepreneurs” last week. The group of women were able to find and articulate their value by the end of the 2 hour session. People buy value but if you want say what you offer, they can’t buy. On average, the attendees gained several levels of confidence in their sales ability. Women on the Move is an amazing funky place full of determined successful female entrepreneurs – just like many other women centric groups. But here, they get nurtured, supported AND they learn how to sell and learn that sales is being of service to others. The only way to grow a business is to sell something. So get over it, and learn to sell professionally or else get a job.